As you all know the Kampot Traditional Music School for Orphaned and Disabled Children (KCDI) is helping over 400 local primary and lower-secondary school children with free training in the arts. We of course teach Pin Peat and Mahori music, classical Ballet and Folk Dance, but we also teach ancient Yike theatre. The Yike (pronounced Yeekay) is an ancient art form with Khmer, Chham and possibly Malay influences. In a part of what is now modern day Cambodia, there lay the Kingdom of Champa, with a population (the Chham) who were of Muslim religion. Around eight hundred years ago, the Khmer Empire fought with the Kingdom of Champa and this small Kingdom became part of the Khmer empire. Today Chham people and Khmer live together in peace and harmony. In the Province of Kampot, there are many Chham people who are part of an ethnic minority in Cambodia. Although today the Yike is mostly performed by Khmer artists of Buddhist religion. It is an art form that incorporates singing, music, dance and theatre, yet it is unlike any other traditional Cambodian music or dance, because the singing is different, the dance moves are different and special drums are used similar to those used in the music of the Chham people today. The Yike evolved as an art form for people from the countryside and it expresses historical events, moral and religious tales and sometimes humourous representations. Yet this extraordinary art form after the Khmer Rouge genocide and the decline in traditional culture, risks extinction. That it is why it is so important that young children have access to proper, expert training so that they can continue their cultural heritage on into the future. One of the most famous Yike troupes is based in Chhouk District in Kampot, they have won many national awards and accolades. It is the leaders of this troupe, a husband and wife team, who teach the Yike at our school. We are so honoured to have them. You can see in our photographs with this report, how many children are enthusiastic to learn Yike. From such a large number, certainly there will be those who will form a profession as Yike artists. Our residential children (see www.globalgiving.org/residential-care-for-vulnerable-children-cambodia) recently won another trophy, also pictured with this report. 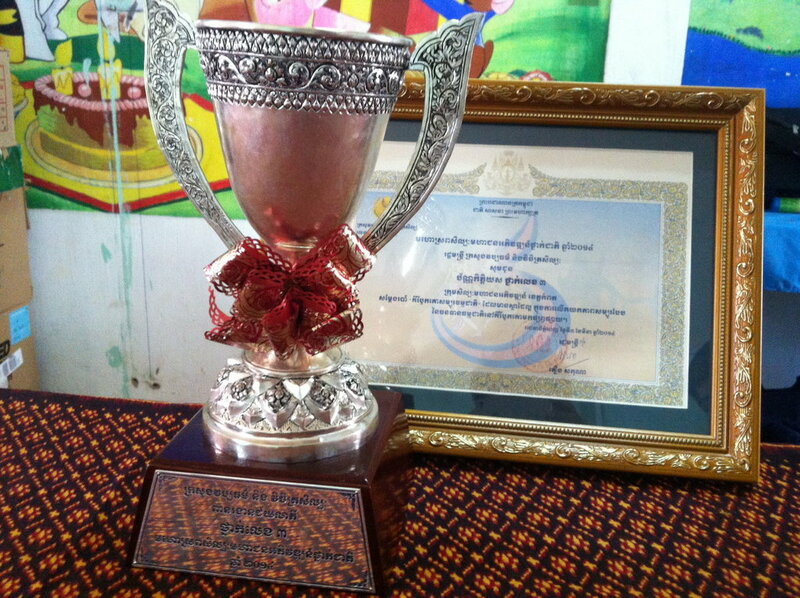 This time they won third prize in a National Competition held at the National Chaktomouk Theatre. The competition was larger than the last regional one. Their dance was specially coreographed for them by a folk dance teacher from the Kampot department of Culture and our school was invited by the Ministry of Culture to perform in the competition. Thank you for your wonderful help in helping keeping alive these unique traditions at our school. Please tell all your friends and please encourage everyone to give generously. We need special help to support our teachers to train so many children. Please help support our residential program too! Since 1994 the Kampot Traditional Music School for Orphaned and Disabled Children KCDI, (Cambodia), has been helping very vulnerable children in the Province of Kampot. These children have lost their parents, or have been abandoned or abused. Working closely with the Ministries and local Departments of Social Affairs, Culture and Education, our school has developed a detailed program to provide care and training for these children. We also focus on the preservation and development of Cambodian performing arts, almost lost after the Khmer Rouge genocide which killed up to 90% of Cambodia's artists. Through the use of the arts as well as scholastic education, we can help children find a sense of identity, purpose and vocation, whilst working towards the conservation of Cambodia's cultural heritage. Many grown up children have graduated and gone on to University, become professional artists or have jobs and families. At the end of each report, we will write about the different students who have graduated from our school. The group of children who are today under our care, are aged from 11 to 17. They receive formal scholastic education until University level. This year, one of our students will be doing her high school diploma and going on to University. She is both bright at her academic studies, but also a highly talented classical ballet dancer. Both our educational officer and our classical ballet teacher, will help her to make an informed choice about her future studies, as she has the opportunity to attend either ordinary University or the Royal University of Fine Arts. Our children return from their scholastic studies at midday and have lunch and a rest, before going onto extra scholastic language and science courses. They then study traditional Cambodian music, Pin Peat and Mahori, classical Cambodian ballet, folk dance and ancient Yike theatre. Our school KCDI carefully coordinates lesson timetables to fit our residential children's needs with those of children coming on our Community Arts Outreach Program. These latter children come mostly in the afternoons for their lessons, on those days when the Community Outreach Children don't have lessons, then residential children can have afternoon lessons. 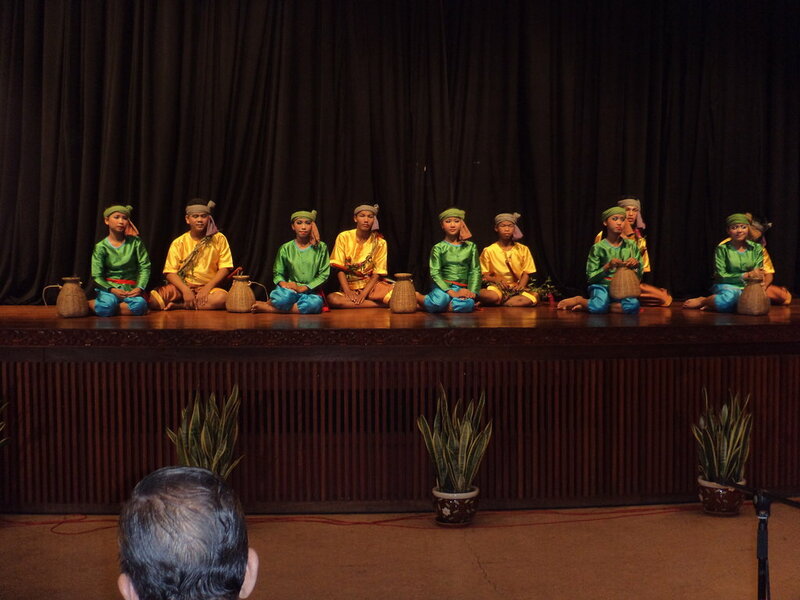 Some Saturdays are taken up with public performances, either official ceremonies or performances given by KCDI to help students perfect their skills in front of a public. In general, children rest on Saturdays and Sundays and play volleyball, football, watch television, enjoy the large garden and sit under the Tamarind trees. Together with their housemother they also do group games, painting, drawing, clay modelling and meditation. Sometimes the local Buddhist monk comes to explain children about Buddhist teachings, Cambodia being a predominantly Buddhist country. The school is situated in large gardens with many flowers and trees and two ornamental fish ponds. This provides our children with a sense of peace and security. There is also a vegetable garden and fruit trees. Thanks to your support we will be able to continue running this program, providing our children with food, clothing, medical care, staff support, academic education and training in fine arts. On the 22nd of February 2014, our children performed the "Bokor Dance" especially coreographed for them by a dancer from the Kampot Department of Culture. Our children were invited to perform this Folk dance, depicting the people, animals and forest of the Kampot Bokor Mountain National Park, by the Ministry of Culture for the occasion of the National Cambodian Arts Festival in the capital Phnom Penh. Last year the Kampot Traditional Music School for Orphaned and Disabled Children KCDI, was cited as a role model for the rest of Cambodia, by the Minister of Culture. In the future we would like to expand our cultural program to include Bassac Theatre and Cambodian shadow puppet theatre. These art forms will help to enrich our children's knowledge and enjoyment of Cambodian arts, as well as helping preserve them and bring them to Kampot where such performances are very rare. We would also like to care for the two younger siblings of children already resident at school. Due to current lack of funds we cannot responsibly take them under our wing, despite them being in great difficulty. The local Department of Social Affairs has already given its permission for our school to assist them. Lena* graduated from KCDI last year as a Plein Ka and Mahori musician, as well as a Folk Dancer. She then married and set up her own performance group with her brother Noy*. Noy graduated from KCDI as a musician and a painter, as well as a Folk Dancer. Together with other students graduated from our school, they perform at traditional weddings and ceremonies in Kampot. They help conserve Cambodian traditions, whilst running their own business. Lena also teaches performing arts during the daytime at a local German NGO. Three months on from our last update, our Community Outreach Arts Program at KCDI has now more than four hundred primary school children participating in lessons on Pin Peat and Mahori music, classical Cambodian dance and folk dance and also Yike theatre. Our classes continue to be held three times a week, but lessons have multiplied, because of the demand. We are working in close cooperation with the Departments of Culture and Education, as well as heads of local primary schools, they are assisting us as we coordinate diffierent students from different schools. They have asked us to help them by reaching out to as many children as possible to share Cambodian performing arts, because there is growing concern about the loss of Cambodia's cultural heritage. Many children attending KCDI are very poor and would otherwise have had no access to this kind of experience or opportunity. Thank you for your help! Meanwhile the more experienced students on our Boarding Program were invited by the Department of Culture together with their teachers to perform at the Regional Performances in Sihanoukville from the 25 - 28th November 2013. 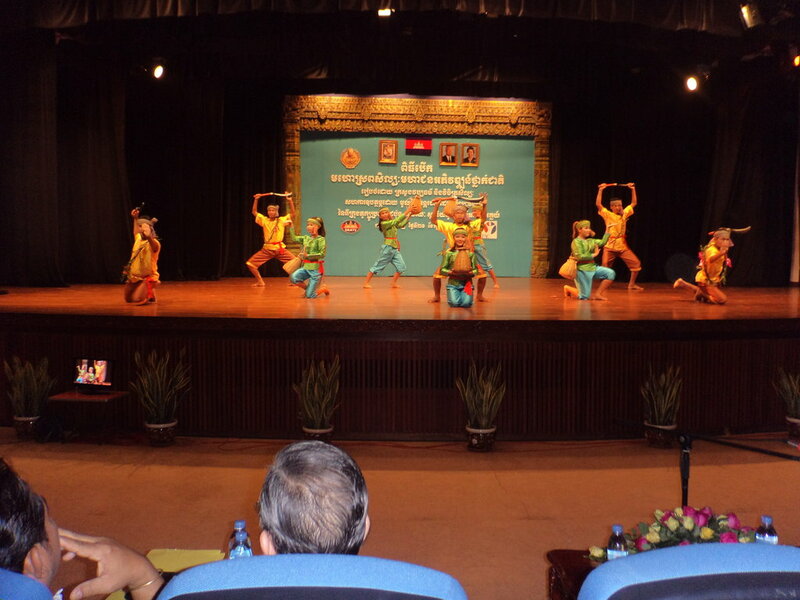 They performed the "Kiri Bokor sambo tomchet dance", especially coreographed by KCDI dance teachers. They were awarded a trophy at the end of the performance. After the performance Sreida* said "I am very pleased and grateful to my group for all the hard work they did to achieve this goal". Community Art Outreach students did their first public performance at KCDI and now both they and resident children on the KCDI Boarding Program, will be preparing for examinations for the coming year, held by the Royal University of Fine Arts in Phnom Penh. These exams help provide them with goals to achieve and for those wanting to have a future in the performing arts, the yearly exams and the final Diploma and Baccalaureate are essential qualifications for a career. Please keep supporting us. Your help has been so important so far. Tell everyone you know about us and share our work on your social networks, (face-book, twitter e-mail). Please spread the word that it is easy to give a simple donation on-line through our page on Global Giving. From everyone here at KCDI, we send you our profound thanks and wish you all a most Happy Christmas and Peaceful New Year 2014! * For the sake of Privacy, we do not mention the student's real name. All photographs are printed here with permission given by the students and teachers of KCDI.